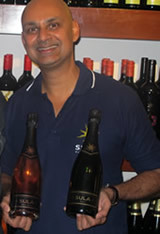 Oct 16: Rajeev Samant released a new set of Brut, Brut Rosé and Seco sparkling wines with new packaging and a slightly different blend in front of a set of special invitees at the newly opened Tasting Cellar at the Nashik winery of Sula Vineyards, amidst speculation that the move was to brace for the competition from the launch of Chandon by the formidable Moet Hennessey, writes Subhash Arora who was present at the Launch. The newly launched wines were available for tasting before dinner laid out for the guests at the Little Italy and Soma Restaurants where the first-ever Indian Grape seed oil was also showcased and was also available for tasting as well as in the various pastas. (Read a separate article on that by our Mumbai Correspondent Rishi Vohra). 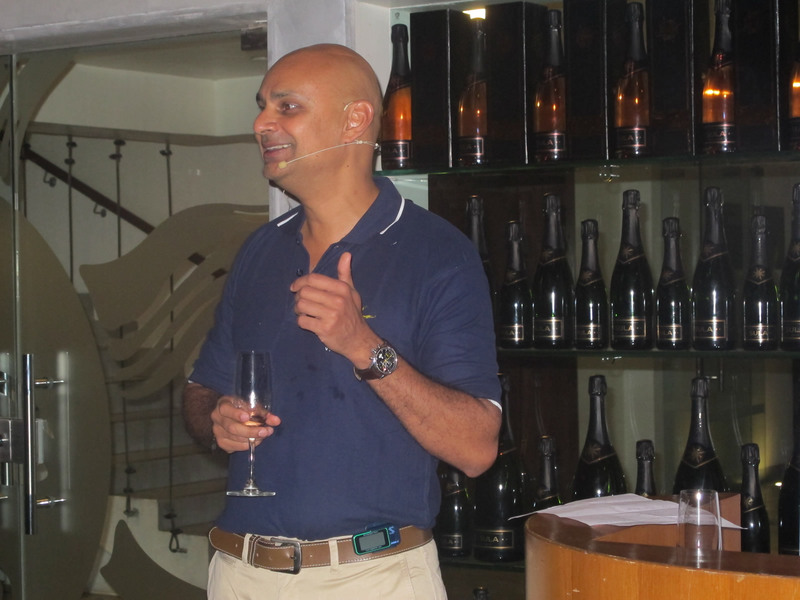 Giving a short history on how the sparkling wines evolved in Sula, Samant said that they were first released in 2001 with 100% Thomson Grapes, aka Sultana. At that time he had defended the grape variety by saying that the wine was very fresh and fruity when drunk young. He had never broached the subject of high profitability using low cost grapes. He also admitted that they had labeled it as Champagne initially but later changed to Brut voluntarily. 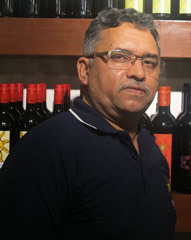 It’s possible that a strong suggestion from Subhash Arora, President of the Delhi Wine Club, at a club dinner with Sula wines at the Taj Palace, Delhi might have helped. 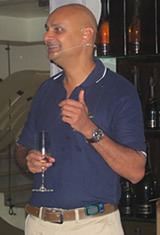 Arora had warned him that the Champagne people (CIVC) would catch up with them soon and prosecute them since the GI rules did not allow the use of word ‘Champagne’ or ‘Methode Champenoise’ on the bottle for bubblies produced outside Champagne. One saw the label changed voluntarily to Sula Brut the very next year. Conceding the need to add more complexity to the bubblies and with the experience gained over the years, Sula had been changing the grape constituents so much that the current launched version has Thomson Seedless as only a small component in the blend of 5 varietals which included Chenin Blanc, Viognier, Syrah and a small portion of Pinot Noir which is now being cultivated in Sula vineyards. ‘I am not saying that the Pinot Noir we are growing would make the best varietal wine today or ever will, as the climate may not be best suited to it. But we get enough flavour and acidity to make our wine complex and crisp.’ He is perhaps right as the newer avatar is lighter, crisper and complex, zingier on the palate and feels more fresh. Rajeev also clarified to the audience that included mostly journalists from Mumbai, Pune and Delhi, ‘we cannot blindly accept what the outside consultants tell us-beyond a certain point. Our climate and soil are totally different and we have no past record whereas they have hundreds of years of experimentation behind them. There are no short cuts except experimentation,' hinting that Chandon might have to go through the same process. His quest for experimentation has taken him to try different grape varietals. ‘I know our competitors have brought out some interesting grape varieties, especially the Italian. We are very happy and I believe together we have to take the industry forward. But we came up with Riesling-a grape that no one thought could be produced in India because of our hot weather. We have produced a delightful Riesling that is off dry (slightly sweet) and goes well with spicy Indian foods and also Asian cuisine. We make only 2500 cases a year and we are very happy with the flavour, ’ he said. Though he won’t commit in public yet, the next grape frontier after bringing out Malbec and Zinfandel (in which Sula has been an undisputed pioneer) is Tempranillo. 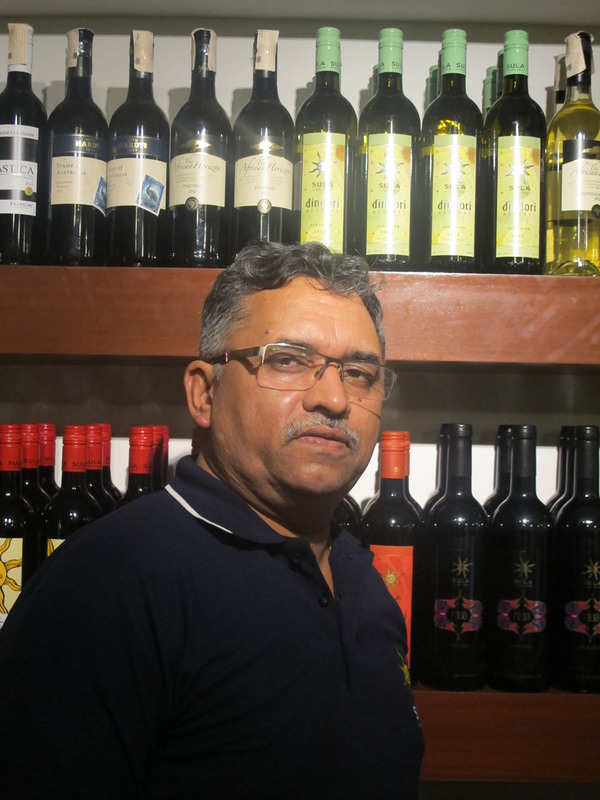 Although the variety has been known to have been grown at their Dindori vineyards many moons ago, Sula seems to be ready with another product launch. He believes that because of the early ripening quality, this varietal is quite suitable for our climate. Brut Rosé had elegant packaging. The refreshing flavour has hints of red berries like strawberry and red cherries with roundness. The sugar level felt slightly lower. He explained away the change in the blend of three grapes, with Zinfandel and Chenin as the major varietals with more complexity. ‘I believe that none of us present here, were as sophisticated ten years ago in our taste as today. As the market is becoming more sophisticated, we are also trying to change our style’, says the visionary who never budged from his off-dry Chenin Blancs often trashed by Indian and foreign critics alike for its over-sweetness. The novices love that grape and the its sweetness and he has been laughing all the way to the bank for over a decade even though it was Sauvignon Blanc that got him international notice when Angelo Gaja, tasting his wine at the Vinexpo in Tokyo in 2002, was so impressed that he placed orders and brought him to the public notice. Rajeev might have had a business compulsion in keeping the wines off dry. According to a senior manager they did reduce the residual sugar from 20 gms/ liter to 10 gms in one vintage (most other producers now produce it with 3-5 gms sugar) but the sales plummeted by over 50% in that year. The tastes are gradually changing though. Sula is planning to soon come out with a dry and complex Chenin Blanc that has sugar level of only around 3-4 gms, as I felt on my palate when Ajoy Shaw, their Chief Winemaker opened a sample bottle specially for tasting. It was simply superb and will be highly appreciated by the connoisseurs who were novices barely a few years ago. 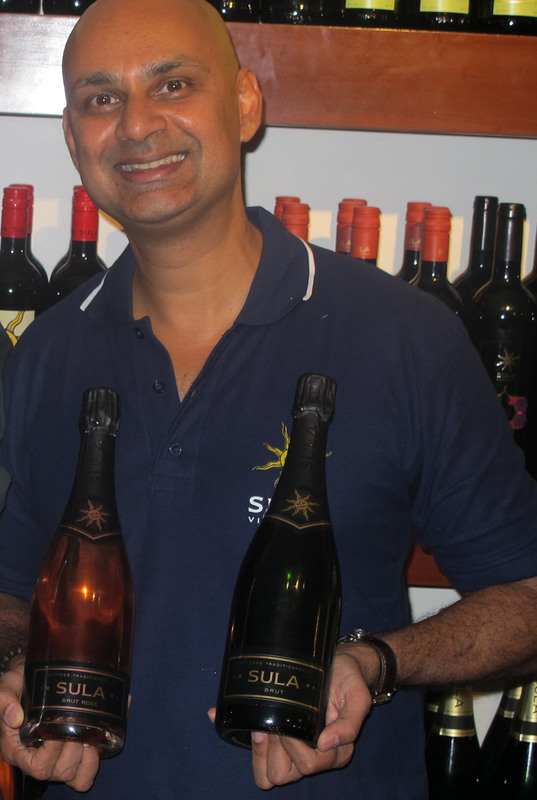 Earlier, Deepak Bhatnagar, Executive Vice President, Sales and Marketing, who, when confronted with the soon-to-change scenario of sparkling wine market it India, said with a smile of confidence, ‘we are well prepared for the challenge. No matter what strategies they adopt, we have planned one better.’ When asked about the expected price of Chandon to be announced at the launch later this week, he said that the Brut is at Rs.1200 in the Mumbai market. These prices are certainly much lower than anticipated and would signify an aggressive strategy by LVMH, the owners of Moet and Chandon. 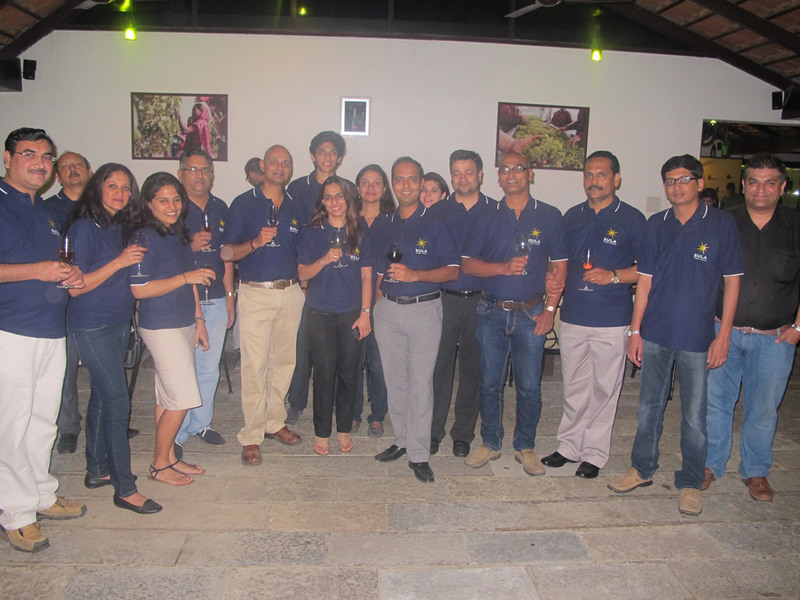 Coincidentally, I had met Team Chandon at the Sulafest at the Sula winery in February 2011 and had rounded up all of them for a quick chat and reported in delWine about the release that was anticipated last Diwali. 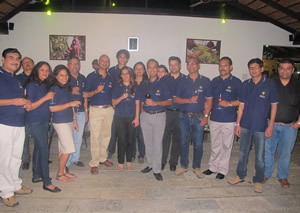 Almost a year later, Sula, the leading producer of wines including bubblies, is all padded up to face the googlies from the biggest champagne producer. No matter what the final score is, the wine loving spectators are in for an exciting match! We shall of course, keep on bringing the commentary to you through delWine!